Kensight "SLAM" White Dot Fixed Rear Sight fits Novak LoMount Sight Dovetail Cut. The latest variation of our popular Defensive Fixed Sight, the Kensight "Slam" sight allows for one-handed cocking/cycling on any 90 degree angle such as a belt loop. The 860-662 rear sight features a recessed blade to reduce glare, a large relief cut for an excellent silhouetted sight picture, and two Artic white recessed dots. 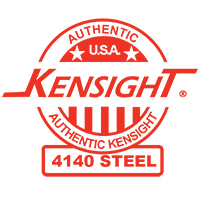 All Kensight sights are Wire-EDM cut from a solid block of 4140 steel, not to be confused with other sights that metal injection-molded (MIM) or investment cast. This sight fits the popular Novak LoMount rear sight dovetail cut, often found on many factory, produced and custom 1911 pistols.